Divide the cucumbers between 8 pint jars. Top each jar with 1/2 teaspoon mustard seeds, 1/2 teaspoon black peppercorns, 1 crushed garlic clove, and 1 1/2 teaspoons chopped dill. In a large bowl, combine the vinegar, water, salt, and sugar. Whisk briskly until the salt and sugar is dissolved. Pour enough brine over each jar to cover the cucumbers completely. Cover tightly and refrigerate for at least 48 hours before serving. If you have not traveled to Andalusia, Spain or have not been watching Anthony Bourdain marathons on Netflix, you maybe have never heard of Salmorejo. Essentially it is a cold tomato soup or sauce that is a traditional dish in Andalusia. It's similar to a gazpacho, but has a smooth and creamy texture from pureeing olive oil and bread with tomatoes, then flavoring with sherry vinegar. There are many variations to be found online, but this one is simple, quick, and full of flavor. For the garlic lovers out there, a recipe with only one clove of garlic might seem silly. However the flavors of this sauce are subtle, and can be easily overpowered by too much garlic. The dish is superb as a cold soup, but with the Spanish tapas culture as inspiration, using the puree as a sauce is full of possibilities. So if you have not been to Main Street Meats, maybe this post will convince you to wander down to Main Street. You can pick up a fresh Baguette at Niedlov's Breadworks, then pop in next door to sample an impressive selection of aged charcuterie. Place all ingredients in a blender and puree until they have a very smooth and creamy texture. Add water to thin if you are having as a soup, or leave thick if using as a dressing or sauce. Chill for a few hours before serving with cured meats, boiled egg, and a drizzle of olive oil. To make sandwiches as pictured below: Slice fresh french bread, spread salmorejo over the bread, then top with salami, cecina, or lomo cured meats. This is an exceptionally versatile dish, which can be made many ways to suit your taste or dietary needs. Essentially: Eggplant and spaghetti sauce go really well together. Traditional lasagna is a delicious comfort food, but often comes with a lot of fat, carbohydrates, and not enough protein or fiber to offer balanced nutrition. The version in the photograph has thin strips of eggplant instead of traditional lasagna noodles. It also has no cheese, but is topped with a scrumptious mixture of grated squash, panko breadcrumbs, olive oil and herbs. The result is a really delicious high-protein, high-fiber, lower-fat version of lasagna with a flavorful, crispy topping. If using ground beef, place in a medium stock pot and break into small bits with a spatula or cooking spoon. Season well with kosher salt, black pepper and herb blend. Cook on medium-high heat, stirring often, until browned. Add the red wine, crushed tomatoes, tomato paste, and bay leaves. Stir until combined, then reduce heat to low, cover and simmer for at least one hour, but longer if you have time. Stir occasionally. The longer the sauce cooks, the more complex the flavors will be. Natural sugars in the wine, tomatoes and onions will sweeten the sauce with longer cooking times. Shorter cooking time will produce a tangier sauce. After cooking the sauce, remove from heat and let rest for one hour before assembling the lasagna. Letting the sauce rest will improve the flavors. Cooking one day ahead, refrigerating the sauce, then layering the lasagna on the second day will also produce a very flavorful sauce. Preheat oven to 375 degrees. Place slices of eggplant on a parchment lined baking sheet and brush with a little oil on both sides. Season with a little kosher salt. Place in the oven and bake for about 15 minutes, or until the slices have dehydrated a little and begin to brown. remove from the oven and let cool. 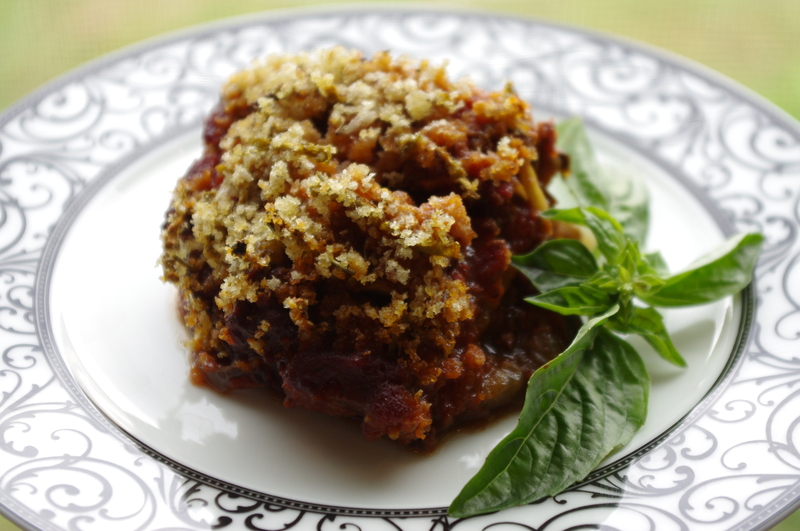 In a high-sided baking dish, put a layer of meat sauce or marinara in the bottom of the dish. Top with a layer of eggplant, then meat, etc. When you run out of eggplant, cover with a layer of sauce. Mix together the grated squash, breadcrumbs, a little olive oil, and seasonings. Spread the mixture on the top of the lasagna. Bake in the center of the oven for about 40 minutes. Remove from oven and let cool for 20 minutes before serving. This recipe has what seems like a long list of ingredients. Most home-made garden burgers are a combination of many things, but this one pays tribute to any leftover grilled vegetables from the weekend cookout. If leftovers generally are not your thing, don't worry. Transformed into a garden burger, yesterday's meal becomes a protein, fiber, and flavor-packed lunch, dinner or snack. They freeze well, and can turn those late-summer/early-fall vegetables into weeks of delicious, quick meals. Preheat oven to 375 degrees. Line two baking sheets with parchment paper. Chop the grilled squash and eggplant. Combine all ingredients in a large bowl. The mixture will be quite soft, but should not be too watery. Add more breadcrumbs if necessary to absorb some of the excess liquid. 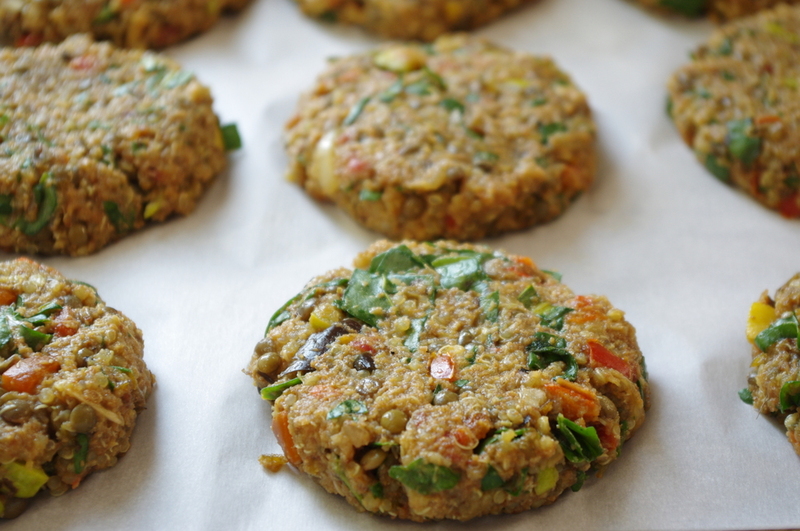 Form into balls (about 1/3 cup), place on the lined baking sheet, then press gently to flatten into a patty shape. Bake for 20-30 minutes. Let rest 10 minutes before serving. Cool completely before freezing. Recipe makes about 20 burgers. Serve on a toasted bun with pesto or whole grain French mustard, lettuce, tomato, and your favorite cheese (optional). Freeze extras in freezer bags. Reheat in a toaster oven or microwave. Roasted sweet peppers are a commonly found for sale in jars or cans for about $6/16oz. Organic roasted peppers can be even more expensive. Making your own fire-roasted peppers, however, is exceedingly easy and inexpensive. Preserving is easy by canning them in jars with water and citric acid, or just pack them in freezer-proof containers and freeze portions for the winter. I used a hot barbecue grill for this recipe, but you can hold them over an open flame on your gas range, or on a baking sheet under a broiler. The main point is to use high heat to blacken and blister the skins of the peppers. This flavors the meat of the peppers, while also allowing the skins to separate easily for removal. Heat grill to a high heat (about 550 degrees) Place red, yellow, or orange sweet peppers on the grill, turning to blacken all sides. Remove from heat and immediately place the peppers in a plastic or paper bag. Alternately you can put them in a bowl with a lid. Allow the peppers to steam for a few minutes, or until they are cool enough to handle. When the peppers are cool enough to handle, gently rub the skins away from the peppers and discard. Remove seeds and stems as desired. Use in recipes, or freeze. Let cool completely before freezing.